Time Krystal – Music in non-equilibrium. Time Krystal is a concert series dealing with states of non-equilibrium. It takes its inspiration from the discovery of the time crystal, a hypothetical structure that repeats not only in space but also in time, never reaching equilibrium. This phenomenon is the starting point for a wide range of sonic experiments operating between stability and fluctuation. Twelve Berlin-based musicians and groups pursue states of continuous change, using a mix of acoustic and electronic instruments. A laboratory for musical experiments that render non-equilibrium audible. 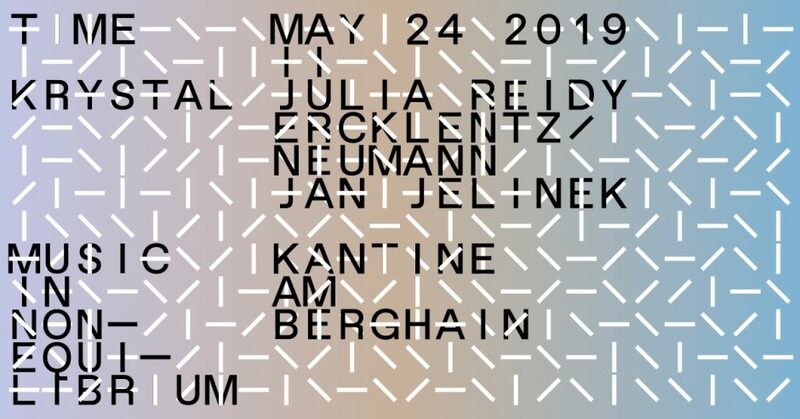 Locale is the Kantine am Berghain on four nights between April and July 2019. JULIA REIDY is a guitarist and composer focusing on instability and endurance, often through an extended palette of raw acoustic sounds, synthesized material and recorded artifacts. As a soloist she has performed works throughout Europe, Australia, South East Asia, Japan, North America and the UK. Her performance and composition practice extends into works for ensembles, installation, multi-media performance, song-forms and soundtracks. Her active projects include SPOILER, the Splitter Orchester, Tennis of All Kinds and Varg. Reidy will present brace, brace: a “dread-tinged incantation unfurling from breath-down-the-neck field recordings, auto-murmured voice, synthetic hum, and irrepressible guitar kinetics”. It combines her 12-string arpeggios with voices and electronic frequencies seemingly coming from outer territories, “at once on-fire and graceful”. The electroacoustic duo ERCKLENTZ NEUMANN has been seeking out the poetry in sound and noise since the late 1990s. Sabine Ercklentz and Andrea Neumann work with a mix of experimental instrumental sounds and analog electronics that collide with everyday noises under the lens of extreme electronic amplification. The artists embrace the inherent dynamics of these sounds and machines, which generate structures that cannot always be completely controlled. They were awarded the Prix Ars Electronica for the video performance Videobrücke Berlin-Stockholm. Their concert venues have included Beursschouwburg in Brussels, the Serralves Museum in Porto, Raw Chicks Berlin, the Resonanzen festival in Leipzig, and the Moderna Museet in Stockholm. The performance drehwurm 1 translates minimalist styles of electronic club music into the duo’s sonic world, creating a thoroughly unique interpretation of pulse-oriented music that oscillates between beat and noise. JAN JELINEK is a musician, producer and remixer. His works deal with the transformation of sounds, translating source materials from popular music into abstract, reduced textures. Bypassing traditional musical instruments, he constructs collages using tiny sound fragments from a wide variety of recording devices including tape recorders, digital samplers and media players. The recordings are processed into repetitive loops that boil the original sound down to its essential components. Jelinek has collaborated with, amongst others, the artist Sarah Morris, the writer Thomas Meineke and the Japanese ensemble Computer Soup. He regularly plays in a duo with vibraphonist Masayoshi Fujita and as part of the trio Groupshow (with Andrew Pekler and Hanno Leichtmann). Since 2012, Jelinek has also been writing and producing experimental radio pieces that deal with fictional identities and soundscapes. He will present one of these, Zwischen, as a live performance. In this piece, non-semantic particles from the interview answers of public figures are transformed into voltages controlling a synthesizer; defective speech acts conducting synthetic sounds.